Rodney Saulsberry has a VO career to envy. Rodney’s voice has been heard on ABC, CBS and FOX. From announcing to movie trailers, audiobooks and more, Rodney is also a gifted singer and busy actor. 1. What has been the biggest change in the Voiceover world since you first started? The biggest change in the voiceover world since I started is the large influx of people trying to participate in the business, more than ever before. Everyone believes that they have an opportunity and that they are able to compete. 2. What advice would you give to a new Voiceover experiencing ‘nerves’ in a session? You should be relaxed with the fact that it’s okay to be a little nervous. Use that nervous energy and adrenaline to make you sharper and more alert. You can cut down on any nervousness by being well prepared for your session. If you have a chance, practice the copy over and over again. Study and learn your craft before you start auditioning or doing sessions. When you are studied and well prepared you will be able to handle your occasional bouts with nervousness. 3. How much time should a VO spend on warming up or exercising their voice? You should warm-up your voice for at least five to ten minutes before working or auditioning. 4. What is it that keeps you interested in the ‘recorded spoken word’ ? The ability to tell a good story is the gift that each vocal performer needs to embody to keep the interest of the listening audience. Your interpretation skills will certainly make you give more excitement to the narration. If you follow the punctuation correctly you will deliver the proper intent written by the writer. When you acquire the ability to accomplish these oratorical requirements you will have mastered the art of making the ‘Recorded Spoken Word’ interesting. 5. If a voiceover career has reached a plateau, how would you ‘kickstart’ them? If your voiceover career has reached a plateau it’s time to reinvent your VO career. You can start with a new demo. New branding may be necessary. New representation could do the trick. Take some classes or go to some workshops. A ‘kickstart’ starts with the realization that you need one. Once you come to the reality in your own mind that it’s time to make some changes, the battle is half way won. You just need a plan. And when your plan is written and complete, you have to execute. Good luck! Thanks Rodney. 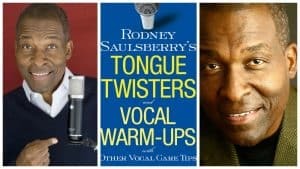 Find out more about Rodney at rodneysaulsberry.com and pick up a copy of his excellent book to help keep your voice in top shape and develop your VO career.